For a comprehensive PortAventura World experience, purchase the 7 Day PortAventura, Ferrari Land & Caribe Aquatic Ticket! 4 days admission to PortAventura Park. One day ticket admission to Ferrari Land. 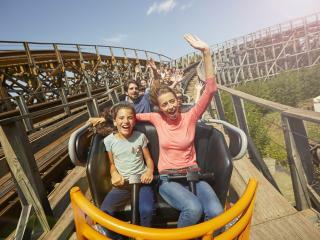 You may also visit PortAventura Park on the same day as your visit to Ferrari Land. 2 days admission to PortAventura Caribe Aquatic Park. Enter PortAventura Park and embark on an unforgettable adventure around the world as you visit exotic places such as China, Polynesia, the Wild West, México, Mediterrània and SésamoAventura, an ideal world of fun for all the family together with the characters from Sesame Street. Each land features an abundance of rides, shows, shops and themed restaurants. Looking for thrills? Head to China and test your nerves on the 8-loop Dragon Khan or perhaps tackle Furius Baco in Mediterrània. PortAventura's incredible horizontal catapult flings you at 135 km/h in just 3 seconds through trenches and tunnels over the spectacular PortAventura lake! Shambhala is a rollercoaster of giant proportions! Measuring 76 metres tall this roller coaster boasts the longest drop and is the highest in PortAventura Park. Angkor transports you to the Lost Kingdom of Cambodia for an exciting interactive river adventure that the whole family is sure to enjoy. Waterfalls of a miniature to a grand scale carve the landscape through Polynesia making room for the likes of Tutuki Splash, a saturating volcanic river splash ride. At certain times of day you have no choice but become drawn to the infectious rhythm and beat of the Aloha Tahiti show, live music and a dance to the Gods will keep a permanent smile on your face. Head over to the Caribbean-themed PortAventura Caribe Aquatic Park to kick back on the lazy river in an oversized rubber ring or relax in the shade of the palm trees. If you’ve still got the energy to burn then there’s more than enough to quench your desire in the shape of high-speed water slides and vast wave pools. Discover Europe’s highest free fall slide which poses a challenge for even the most adventurous. And right next door you will find a multi-bump slide that runs for over 100 metres. Other highlights include a 6-lane racer slide where adults and children can compete to see who can get down the fastest. Children can enjoy an incredible pirate adventure in the children’s pool that shelters a pirate ship filled with Sesame Street characters. Start your engines and get ready to live an unforgettable experience as Ferrari Land comes to Europe. With your Ferrari Land ticket, discover 70,000 m2 of pure Ferrari pleasure including the tallest and fastest vertical accelerator ride in Europe. Standing at 112 metres high, Red Force is a spectacular ride taking you from 0 to 180km/h in just 5 seconds for the full range of F1 sensations. Discover a real family racing circuit with a 570-metre track where you can burn some rubber and feel like a professional Ferrari Driver as you take the wheel of an authentic F1 simulator – there is even a simulator for kids! Enter the stunning Ferrari Experience building for a journey into the history, technology and passion of Ferrari. Marvel stunning sports cars in the Ferrari Gallery and feel the power of a Ferrari GT in the Virtual GT Experience. Tour the whole world in an extraordinary lap from the inside of a Ferrari GT. The Ferrari Land attractions will leave you breathless. Ferrari Land is not just for thrill seekers, there’s plenty for kids too! This action-packed park now boasts a dedicated kids area with 5 new attractions. Little ones don’t have to miss out on the famous Red Force coaster, as Ferrari Land have created a kid’s version just for them – the Junior Red Force! It allows thrill-seekers in the making to experience the same sensations as the big kids, just without those dizzying heights. Next up there’s the free fall and bounce back towers which reach a dizzying (for kids!) 9 metres high in a series of never-ending turns, dips and climbs. It’s also a great place to take in views over the rest of Ferrari Land. Based on the sound of a real Ferrari engine, Crazy Pistons gives you the sensation of being inside a working engine as you spin on the axis of it’s pistons. For mini aviators in the making, there’s a new attraction called Flying Race where kids can pilot their very own little plane. Created in honour of heroic aviator Francesco Baracca, who drew a horse on his place that later became the Ferrari symbol. Allows families to take on the challenge of driving a Ferrari together as they face off on this fun attraction suitable for all ages. Featuring loads of classic Ferrari models from throughout the years, this attraction is a great introduction to the world of motor racing. Ticket is only valid for use from 1 June to 15 September 2019 when PortAventura Caribe Aquatic Park is open. Once booked and confirmed this ticket is non-changeable and non-refundable. You will be sent an official gate-ready PortAventura Ticket ensuring minimum fuss when you arrive. There is nothing to redeem and you simply go straight through the gate on arrival. Ticket is valid for 7 consecutive days. Gate normally opens at 10.00am, but opening hours may change without prior notice and you are advised to check before your visit date. Children aged 0-3 years go free and no ticket is required. This ticket is non-refundable and non-transferable. 100% Cancellation Fees apply. How do I get my 7 Day PortAventura, Ferrari Land & Caribe Aquatic Ticket? Do I need a 7 Day PortAventura, Ferrari Land & Caribe Aquatic Ticket for an infant? Childrenaged 0-3 years enter Port Aventura Park and Ferrari Land free of charge and no ticket is required. Please note that there are height restrictions on many of the rides. Attraction Tickets Direct act as retail agent for PortAventura. The theme park’s terms and conditions will apply to your booking as well as our own. To view the theme park’s terms and conditions click here. To view our full terms and conditions please click on the link at the bottom of the page.